Japanese mobile phone maker Sony has finally decided to make the Xperia Z flagship Android smartphone available for purchase in the United States through its online store, with a price tag of $630 attached to it. Good news is it is unlocked. Bad news is it will only work on AT&T’s HSPA+ network and there is no LTE here. All color options are available: black, white, and purple, and the phone comes with free 2-day shipping. Model number of this Xperia Z is C6602, keep in mind that LTE Xperia Z will carry the tag C6606. The Xperia Z is Sony's flagship phone for 2013, and continues the screen size and resolution arms race with its 5in, 1,920x1,080 display. It also has all the specifications you would expect from a high-end smartphone, including a quad-core 1.5GHz processor and a camera with a huge 13-megapixel sensor. Sony also dropped the price tag of the Xperia ZL, which was launched with support for North American LTE networks packed inside. 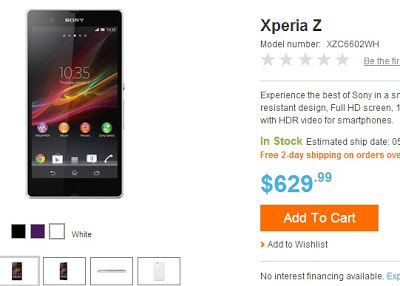 This device is currently available for purchase through Sony at $629.99, the same as Xperia Z. Despite the price cut, Newegg is still cheaper at $610 and has all three colours in stock.